Now that the second term has finished, I feel my time in London is running out. So, I thought I would look back and wrap up my half a year by writing a travelogue of Liverpool, the city of the Beatles (to me, a Beatles enthusiast!). This is also an update of my very first blog post, the London Bucket List. One of things that I had planned during my stay in London is to travel out of the city at least once a month which I named the ‘Monthly out of London Project’. This has been going very well actually. London is a perfect place from which to plan a day trip to cities in the UK as long as you don’t mind sticking to a tight schedule. So, I started my day at four in the morning to arrive in Liverpool for breakfast. I don’t know how but every time I travel something unexpected happens. It might be the beauty of travel but it didn’t feel like it when I found no train going to the station written on my ticket. Long story short, I made it but that used up most of my energy. I’ve described myself as a lover of making lists but I should admit I did not make any to-do lists for a day in Liverpool till the moment of departure. So, as soon as I sat on the train after all that drama, I googled tourist attractions and found out that there is a Beatles tour. It was perfect for someone like me with no plan but lots of passion for the Beatles. I have a few things that I have trouble describing why I love them and the Beatles is one of them. After a four hour journey from London, I arrived in Liverpool a little tired. To start fresh, I grabbed a cup of coffee and headed for Albert Dock where the tour starts. Spotting a group of people near the Beatles story exhibition, I knew I was in the right place. When I got on a bus, a lady from Mexico sat next to me introducing herself as a big fan of George Harrison – I could tell she was because she looked especially excited whenever a tour guide talked about him. So, the tour kicked off by dropping all of us at Penny Lane L18 referred to in the lyrics of the song, Penny Lane. It was so much fun following the track of the song, which is so descriptive, and there is even still a barber shop mentioned in the song. I could imagine John Lennon, Paul McCartney and George Harrison in their teenage years – before Ringo Starr joined the band – running up and down the roads. 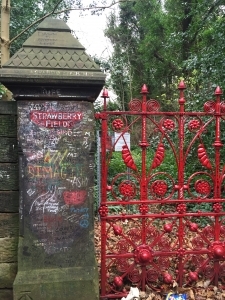 The next stop was the Strawberry Fields where John had lived close by, performed with his friends at a summer garden party and later written a song about. Those two nostalgic songs I think represent early years of the legendary band well. The place, once a Salvation Army children’s home, has been replaced by a modern building which isn’t accessible, but you can see an original gateway that gives a sense of the old strawberry field. There, the most exciting part of the tour ended up being a bit of a disappointment: Paul McCartney’s childhood home on Blomfield Road was unfortunately closed for maintenance reasons. Coming back to the center of the city, I visited the Cavern Club on Mathew Street where the Beatles had performed 292 times and where Brian Epstein offered to become their manager. In the basement, there was performance going on even early in the afternoon. 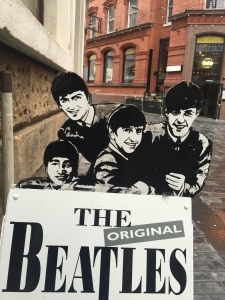 If you are a fan of the Beatles, Mathew Street is a must-visit since it is full of pubs and shops themed around the band. Liverpool has been to me the city of the Beatles but at the end of the day, I loved the city itself with a mixture of historic sites and modern architecture. One day was not enough to visit every bit of the city but it was certainly a pleasant journey which will be remembered as my pilgrimage to the city of the Beatles. Bad Behavior has blocked 250 access attempts in the last 7 days.